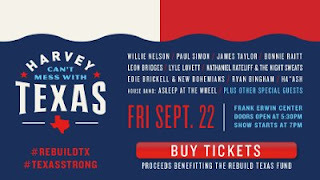 Harvey Can’t Mess With Texas: A Benefit Concert for Hurricane Harvey Relief will take place on Friday, September 22 at the Frank Erwin Center from 7 PM to 11 PM, and broadcast on 11 TEGNA stations and stream internationally on YouTube.com/TexasStrong from 9 to 10 PM CT. The largest live concert benefit in Texas will feature exclusive performances and rare collaborations from Willie Nelson, Paul Simon, James Taylor, Bonnie Raitt, Leon Bridges, Lyle Lovett, Nathaniel Rateliff & The Night Sweats, Edie Brickell & New Bohemians, Ryan Bingham, Ha*Ash, and multiple special guests. The evening will include special appearances by Matthew McConaughey, Dan Rather, Renée Zellweger, Luke Wilson, Austin Mayor Steve Adler, Houston Chief of Police Art Acevedo, and many more. Charlie Sexton will serve as Music Director, with Asleep at the Wheel sitting in as the house band. Tickets for the four-hour live concert will go on sale today (September 13) at 3:00 PM CT at www.RebuildTX.org, with prices ranging from $30-$199. As the exclusive statewide broadcaster, TEGNA will air “Texas Strong: Harvey Can’t Mess With Texas” without commercial interruption across their 11 Texas stations, reaching more than 80% of the state. Made possible by Google, the concert will stream internationally during the broadcast hour on YouTube.com/TexasStrong. Google will match the first $500,000 of donations through a pledge challenge. Volunteers from Google’s Austin office and TEGNA employees will staff the phone banks at select station locations across the state. All viewers can support the relief efforts in post-Hurricane Harvey Texas by donating via telephone or online at www.RebuildTX.org. TEGNA stations airing the broadcast concert include: WFAA, Dallas; KHOU, Houston; KVUE, Austin; KENS, San Antonio; KBMT, Beaumont; KCEN, Waco-Temple-Bryan; KAGS, College Station; KIII, Corpus Christi; KYTX, Tyler; KIDY, San Angelo; and KXVA, Abilene. Proceeds will benefit Rebuild Texas Fund which was created by the Michael & Susan Dell Foundation in collaboration with the OneStar Foundation. The four focus areas of the fund include: health and housing; schools and child care; workforce and transportation; and capital for small businesses. The Dells are working to raise a total of $100 million for the long-term relief, recovery, and rebuilding efforts for all affected communities in Texas. “For us, this is personal,” said Susan Dell. Both Michael and Susan Dell are Texas natives, and Michael Dell is from Houston. “This fund was created to help rebuild all of the communities – big and small – that have been devastated by Hurricane Harvey. We will be rebuilding for years to come,” said Michael Dell. Harvey Can’t Mess With Texas: A Benefit Concert for Hurricane Harvey Relief is generously organized with donated efforts and services by Springboard Productions, Solomon Group, Big House Sounds, Soundcheck Austin, The University of Texas Frank Erwin Center, Hotel Van Zandt, Sodexo, GSD&M, Andy Langer, Texas Music Office, and the City of Austin, as well as media partners KUT/KUTX, 93.3 KGSR, 103.5 BOB FM, 101X, 93.7 KLBJ, MIX 94.7, Majic 95.5, 95.9 R&B, 98.1 KVET, Austin American-Statesman, Austin360, The Austin Chronicle, and Do512. TEGNA (NYSE: TGNA) is producing the broadcast in partnership with Debra Davis Productions. Austin-based C3 Presents will proudly produce the live event with all services donated.